So far, living in Radium Springs has been a trip down memory lane. Not my own memories, well some of my own, but mostly memories of stories told to me and of photographs that I have seen again and again. Exploring the land of my roots, I am meeting the people and places that shape my personal mythologies. The Blue Moon Bar is often closed and I don’t know any of our neighbors but Radium Springs is still populated by the stories I’ve heard and the stories I’ve told myself about what it used to be. This particular quest was to find a site I have seen in many pictures and has become an important backdrop in my own creation myth. 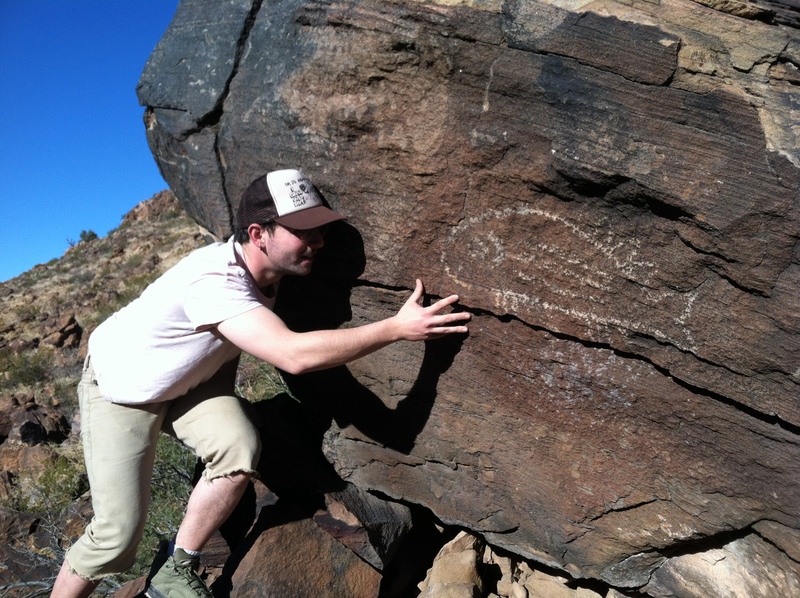 Adam and I set out to find the petroglyphs that are tucked away in a canyon on the north side of Tonuco Mountain. Tonuco is a flat-topped mountain just north of Radium Springs. You can see it perfectly from the house my dad grew up in, which is about 8 miles up the road from where Adam and I are living right now. 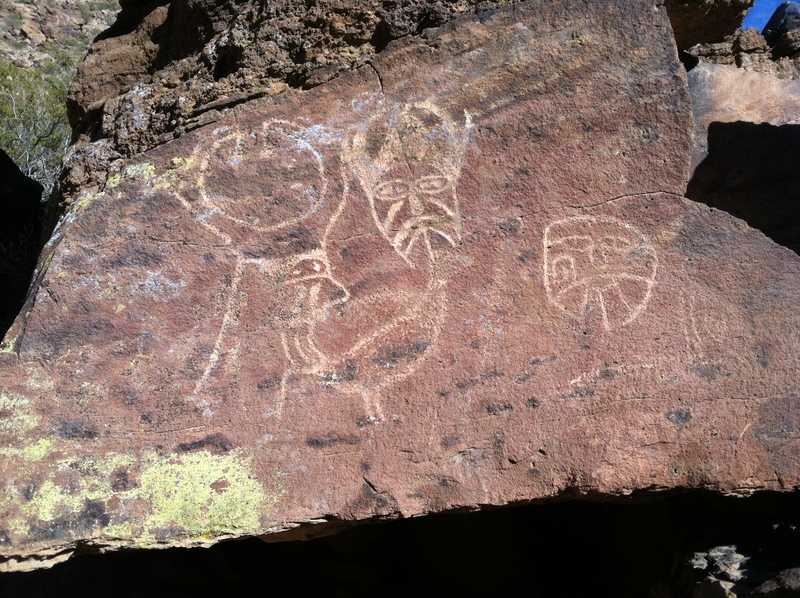 During my previous trip to Radium Springs in 2010, I tried to find these particular rock drawing but had no luck. This time we were more determined and followed my dad’s instructions to look for a dirt road with a gate that went right off of the frontage road on the westside of the I-25. After coming to three different steep, washed out hills, on three different, winding dirt roads that went to the right we decided to try taking the frontage road as far as we could. Before it goes back under the highway, the road turns to the right and leads directly into the arroyo that brushes up against Tonuco. Nervous to go down the sandy hill, we parked and walked into the arroyo, marveling at how different the rocks were from those around our house. 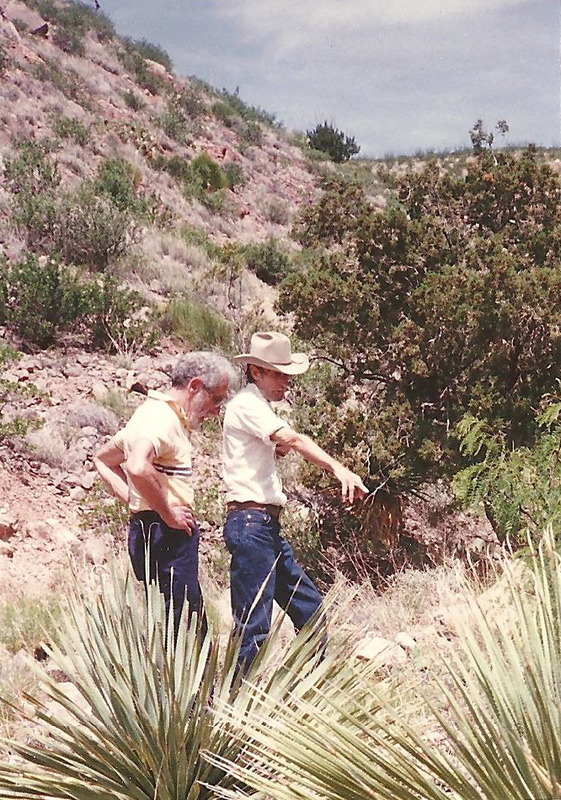 Having seen the north side of Tonuco from our earlier, failed attempts to find the road, we had identified what we believed was the largest and most likely canyon; we knew what we were looking for as we followed the arroyo. After turning into the canyon and admiring the multi-colored sheets of rock, I started looking for the large reddish rocks I remembered from photographs. 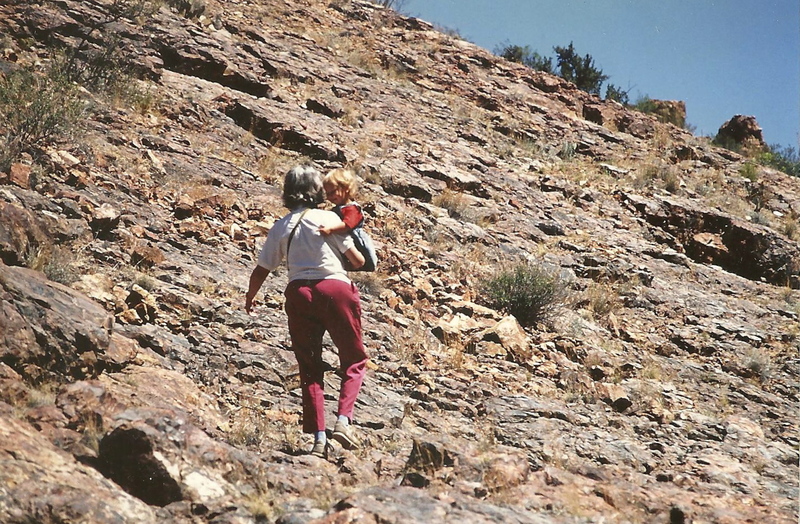 I have seen photos of my dad and mom and grandparents next to large red rocks decorated with drawings of faces. About ten minutes into the canyon, I looked up and spotted what looked like a drawing of a mask. Adam and I rushed up the left side of the canyon and admired the drawings of an animal, two faces, and lots of perfect, identical little hands. We spent some time there and found a drawing of a fish a little higher up. I thought about my grandpa and imagined him there, quiet and so cool. The sun was beginning to set and we decided we should start back. 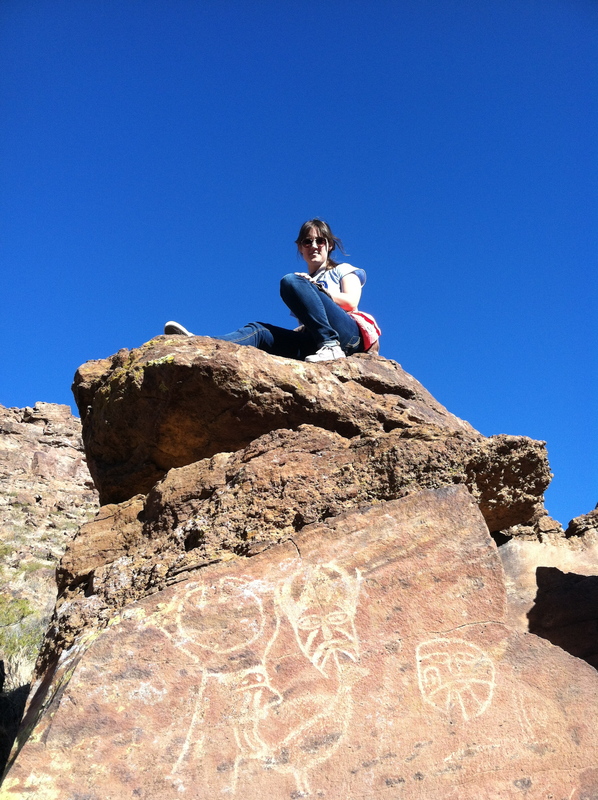 We climbed to the bottom of the canyon again and discovered the enormous number of drawings we had missed. Blinded by our first sighting, we had stopped exploring the area nearby and had not noticed the rocks that were literally covered in drawings!